DELTA-1 LYR (Delta-1 Lyrae). Given its famed naked-eye double Epsilon (if you have very good eyes), any other close pair in Lyra (the Harp or Lyre) might seem like another good candidate, specifically Delta-1 and Delta-2, which are rather easily seen to be a pair (Delta-2 the eastern and brighter of the two). Alas, it is not to be. At 1080 light years, Delta-1, a beautiful hot blue class B (B2.5) hydrogen-fusing dwarf is 200 light years farther than the red class M4 giant Delta-2, with which it makes a fine color contrast. Though the uncertainties allow the two to be the same distance from us, the separation in the sky makes them too far apart ever to be a real double. Delta-1 does not need this line-of-sight false companion, however: it has enough multiplicity of its own. The star itself, Delta-1, with a temperature of 18,000 Kelvin, radiates at a rate not quite 3000 times that of the Sun (after allowing for a lot of ultraviolet light), from which we find a radius of 5.6 times solar. From a fast projected equatorial rotation speed of 117 kilometers per second (typical of such stars), the rotation period is under 2.4 days, less than a tenth that of the Sun. Luminosity and temperature combined with the theory of stellar structure and evolution yield a mass of 7 times solar and confirm that we have a dwarf, one born 32 million years ago and that is now about 70 percent of the way through its hydrogen-fusing dwarfhood. Though massive, the star is still nicely under the limit at which it would blow up, and is destined to become a heavy white dwarf of about a solar mass similar to Sirius B. Delta-1 Lyrae has a number of connections with other stars. To start, it appears to be triple, with a close spectroscopic companion that orbits every 88.352 days. Nothing is known about it. If a solar mass, the lesser star would orbit Delta-1 proper at a mean distance of 0.8 Astronomical Units, a significant eccentricity taking it between 1.1 and 0.5 AU. Then, a roughly tenth magnitude companion is keeping good pace with Delta-1 and is almost certainly a real mate. Lying not quite three minutes of arc -- at least 58,000 AU - - away, it is most likely a class A dwarf that takes at least 4.5 million years to orbit. Taking a wider view, Delta-1 Lyrae seems to be the core of a small open cluster called, not surprisingly, the Delta-1 Lyrae cluster. The Delta-1 Lyrae Cluster. While appearing to be a naked-eye double, Delta-1 and Delta-2 Lyrae have no physical relationship. 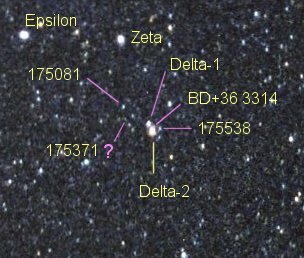 Delta-1 does, however, appear to be at the heart of a small cluster whose stars are indicated by the purple lines. The numbers are from the Henry Draper (HD) Catalogue with the exception of the one from the Bonner Durchmusterung. One of the indicated stars has questionable membership. Another dozen or so fainter stars are involved. Vega is off the top of the picture. Epsilon Lyrae, a naked-eye double, is not quite resolved, resulting in an elongated appearance. Zeta Lyrae is a complex system as well. Some 19 members were at one time identified, though not all have been confirmed and the cluster remains tentative and though its calculated distance of 1100 light years nicely matches that of Delta-1 itself. A yet wider view seems to show that Delta-1 and its cluster-mates are part of a much larger, young, gravitationally unbound "association" that spreads over both Cygnus and Lyra and that includes Aladfar, Eta Lyrae as well, the association's age of 60 million years not that far off of that of the Delta-1 itself. Written by Jim Kaler 4/25/08. Return to STARS.